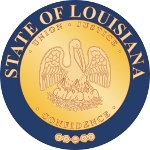 Louisiana is located in the south region of the U.S. And is the 31st ranked most extensive state with a total land area of almost 52,000 square miles. It is also the 25th ranked state in terms of population with roughly more than 4.5 million people living inside the states borders. The state capital is Baton Rouge, however its largest city remains New Orleans. It is the only state in the country that employs a political subdivision (called parishes) system, where local governments are equivalent to counties. The culture within the state was largely influenced by the early French, Native American, and African cultures prevalent in the area. 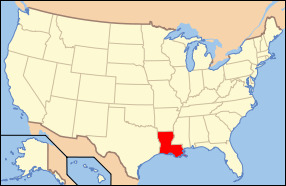 The land where present day Louisiana resides was first a French and Spanish colony. At this time many African Americans were imported into the state for slavery purposes in the 18th century. Texas borders Louisiana to the west, while Arkansas constitutes its northern border, Mississippi to its east, and the Gulf of Mexico creates its southern border. The state can be divided into two sections which consist of the uplands in the north region and the alluvial which is along the states coast and consists primarily of swamp lands, marshlands, and beaches. The state experiences humid subtropical climate which is essentially what all the south central states experience. Generally this type of climate is best described as long hot and humid summers with very short and mild winters. This type of climate is largely influenced by the Gulf of Mexico. The main industries that are thriving in Louisiana are agriculture (which consists mainly of rice, soybeans and cotton), oil and natural gas, salt production, and fishing. The states highest point is recorded as Driskill Mountain which sits 535 feet above sea level, and the lowest point is New Orleans which resides at 8 feet below sea level. The state bird is the Eastern Brown Pelican, the state mammal is the Louisiana black bear, and the state reptile is the Alligator. The state flower is the Magnolia Blossom while the state tree is the Bald Cypress tree. The state of Louisiana has a wide array of activities and landscapes which attract people from all across the country, making it an ideal vacation location for many people, especially to the city or New Orleans. The state is easily one of the prime locations in the U.S. For people looking to enjoy the outdoors or city life alike, and it will continue to remain a key player in the overall economy of the United States.